A field of 643 came out for the $1,500 Limit Hold'em event, and when all was said and done Tomas Alenius of Sweden had claimed all of the chips, one bet at a time. 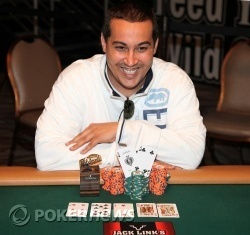 This marks Alenius' second WSOP cash this summer -- and fifth overall -- and his first WSOP gold bracelet. There were 15 players left standing after the first two days and 20 levels of play, at which point Al "Sugar Bear" Barbieri held the chip advantage. When play began today, escalating stakes quickly caught up with half of the field, and in just two levels the field had shrunk to six players. With six left, Barbieri was still the clear leader with nearly 1.2 million chips, with Glenn Engelbert his nearest competitor at the time with 465,000. However, after the shorter-stacked players, Dominik Kulicki and Demetrios Arvanetes, went out in sixth and fifth, respectively, Engelbert found himself on the slide. Unfortunately for him, Engelbert found it necessary to commit the last of his chips on a hand when Alenius held pocket aces, and he went out in fourth. The three remaining players -- Barbieri, Alenius, and Jason Tam -- were nearly even in chips when three-handed began, but Sugar Bear quickly lost ground and was out in third. When heads-up play began, Tam had a 3-to-1 chip advantage with 2.175 million to Alenius' 720,000. But with limits of 40,000/80,000 -- and eventually 50,000/100,000 -- a couple of good hands could change things quickly. And change they did. After over an hour of back-and-forthing, Alenius had the big advantage, and eventually all of the chips. Congratulations to Tomas Alenius, champion of Event No. 26! Thanks for following our coverage here on PokerNews. 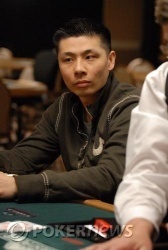 Jason Tam raised from the button, Tomas Alenius three-bet, Tam raised all in and Alenius called. 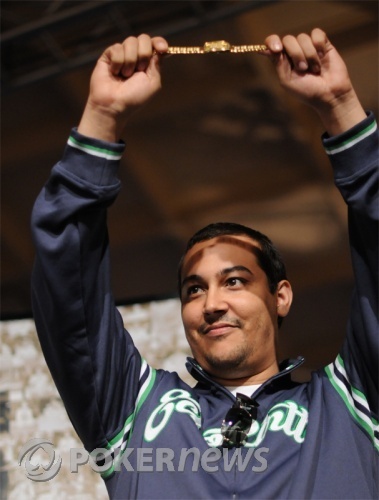 Alenius' railbirds were clapping and cheering for their man as the cards were turned over, and they erupted as the board ran out to give him the win a career-high score of $197,488 and his first WSOP bracelet. For his runner-up finish, Jason Tam earned $122,000. Jason Tam raised from the button, and Tomas Alenius called. The flop came . Alenius checked, Tam bet, Alenius check-raised, and Tam called. The turn was the . Alenius bet, and Tam called. The river was the . Alenius bet again, and with a wincing expression Tam made the call. Alenius turned over for the rivered full house, while Tam showed for the beaten flush. "Sick," said Tam, as the pot was pushed his opponent's way. Alenius has taken the upper hand again with 2.2 million to Tam's 500,000. Neither player is giving up easily in this heads-up battle. Though Tam swung as low as 870,000 after dropping two consecutive pots to Alenius, he was able to recover within only a few hands and currently holds 1.1 million to Alenius' 1.7 million. With the blinds up to 50,000-100,000, a typical pot is in the 400,000 range and there are only 28 big bets in play at present. From where we stand, it looks like whomever can go on a good run first is going to take down this bracelet. Jason Tam opened with a raise on the button, and Tomas Alenius called. The flop came . Alenius checked, Tam bet, and Alenius called. Both checked the on the turn. The river brought the . Alenius checked, Tam bet, and Alenius paused for a few beats, then called. Tam showed for the rivered straight, and Alenius mucked. That pot plus a couple of others brings the pair back close to even again, with Tam at 1.4 million and Alenius 1.5 million. Jason Tam raised from the button and Tomas Alenius called. The flop came down . Alenius checked, Tam bet, Alenius put in the check-raise and Tam called. The turn was the and Alenius led out. Now Tam raised and Alenius made the call. The river was the and both players checked. Tam showed but Alenius had him one better with , taking down the pot with a pair of fives. Two hands later, Tam raised again from the button and Alenius called. Alenius check-raised the flop and Tam called. The turn was the and Alenius check-called a bet from Tam. The river fell the and both players checked. Alenius showed and Tam mucked. He's down to around 875,000 while Alenius has about 2 million. It's a relatively tranquil scene here in our corner of the Amazon Room as Tomas Alenius and Jason Tam battle it out to decide who will claim the next WSOP gold bracelet. With the other tourneys all on break and just a few heads-up matches going on nearby, there is not a lot of noise surrounding the two competitors. They are keeping mostly quiet as well, only occasionally sharing brief exchanges about recently folded hands. The pair are just about even in chips at the moment, with both having approximately 1.45 million. After a series of small victories, Tomas Alenius has chipped up enough to overtake the lead from Jason Tam. Alenius now has about 1.5 million to Tam's 1.4 million.